Why Should I Match My Tubes? Power tubes are electrically matched so each tube will have the same amount of “idle” plate current and amplification characteristics when used in an amplifier. This is done so the tubes can work together in your amp giving you optimal sound quality and tube longevity. Matched tubes also receive extra quality checks to reduce the possibility of getting a faulty power tube that may have slipped by the manufacturer. 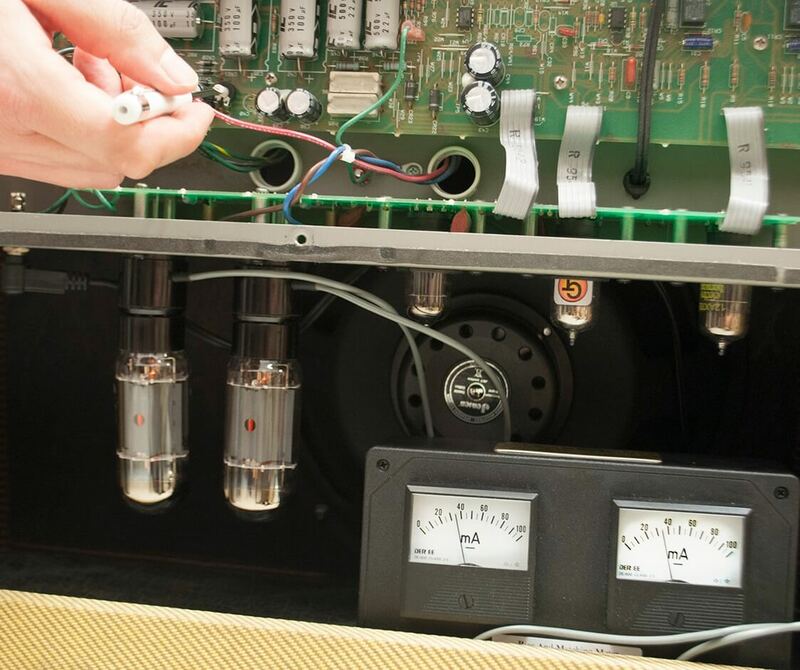 Let's look at some of the basics of how tubes work to have a better understanding of the benefits of using matched tubes versus unmatched power tubes in a guitar amp. Figure 1 - Simplified illustration of how the fundamental parts work to control current flow in a vacuum tube. Because current flow was originally thought to be the result of moving particles with a positive charge, the conventional direction of current flow is drawn from positive to negative – opposite to the direction of actual electron flow as shown in Fig. 1. Matching comes into play because tubes vary in the amount of plate current flowing through them when given the same control grid and plate voltages. Adjusting the amount of negative control grid voltage for an optimal amount of idle plate current is referred to as “setting the bias.” In a fixed bias guitar amp, the negative grid voltage is set by adjusting a bias pot. If the bias pot is set too cold, the sound will be lacking in warmth. If the bias pot is set too hot, the tube will be overheating and the sound can be lacking in definition. 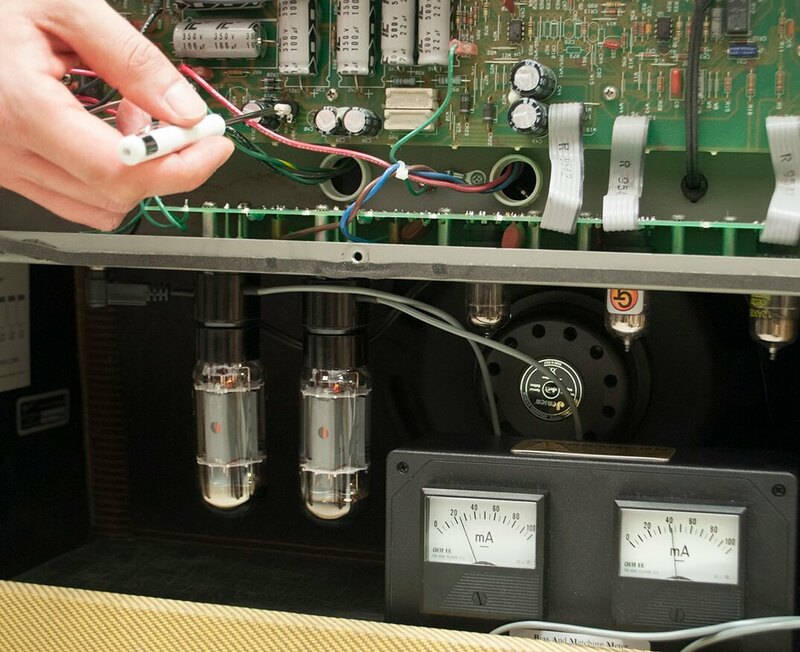 Setting the bias involves finding a bias point where the amp sounds the best and the tubes are not overheating. As seen in the Fender® Blues Deluxe® amp of Fig. 2, the tube on the left has an idle plate current measurement of about 25 mA, while the tube on the right has about 42 mA. Why does this difference in idle plate current matter? 6L6GC tubes in that amp sound great when biased for about 35 mA of plate current, but with unmatched tubes, you can't get both tubes biased at that sweet spot. The tube with more plate current will be dissipating more power and getting hotter than the tube with less plate current. This means the tube on the right will wear out quicker than the tube on the left, leading to an earlier loss of clarity and definition. The tubes in Fig. 2 both had plate voltages of about 428V. Plate dissipation is calculated by multiplying the plate current by the plate voltage. The tube on the left was dissipating 10.7 Watts (0.025A x 428V), while the tube on the right was dissipating 18.0 Watts (0.042A x 428V). Figure 2. - Unmatched 6L6GC tubes biased for an “idle” plate current as close to 35 mA as possible. Fig. 3 shows a matched pair of 6L6GC tubes in the same amp. What's the advantage? Both tubes can be biased at the sweet spot in this amp with about 35 mA of idle plate current. Both tubes are dissipating the same amount of power and can be adjusted together for optimal sound quality and tube longevity. They will allow for more playing time with rich, well defined tube tone. The tubes in Fig. 3 both had plate voltages of about 424V. So both tubes were dissipating 14.8 Watts (0.035A x 424V). Apex® matched tubes are matched for plate current and transconductance. Plate current matching makes sense. So what's transconductance? Think about it this way – the power tube conducts a certain amount of plate current depending on the amount of plate voltage and control grid voltage we apply to it. The “trans” in transconductance describes a change in conductance. Transconductance is a measurement of how much the plate current changes as a result of a corresponding change in the control grid voltage. If you're familiar with Ohm's Law, you'll know that voltage (V) divided by current (I) is equal to resistance (R) and resistance is measured in ohms. Conductance is the inverse of resistance and is equal to current (I) divided by voltage (V) with a unit of measure called the “mho” (ohm spelled backwards). Tube transconductance is measured in units of mhos – usually, micro-mhos or milli-mhos (1000 micro-mhos = 1 milli-mho). Why are Apex® matched tubes matched for transconductance in addition to plate current? To avoid a situation where the idle plate current is matched at one bias setting, but unmatched at another. Transconductance is related to the amount of amplification the tube provides at a particular bias setting. A higher transconductance means more amplification for the same signal. If two tubes are biased for the same amount of idle plate current, but provide different amounts of amplification, are they truly matched? Why match tubes? It puts you in control of your tone. Matching the plate current and transconductance allows you to set the bias with maximum precision for that optimal sweet spot where the tubes will sound their best and won't burn out early.